I am now fully immersed in Gen Con! Come by the Blind Ferret megabooth (#541) if you'd like to say hello, nab some swag or get a drawing. Meanwhile, our current chapter ends today. Now traditionally, next week would be the start of this year's annual O-GAWD (the Obligatory Guest Artist Webcomic Duration, for any newbies in the audience). But this year, we're doing something a little different! Come back on Monday for the start of an epic new short story that required Shannon and I and several other secret artists to craft. It's a project that we've all been working on it for a while now, and we can't wait for you to see it. I think you guys are really going to dig it! Who's going to be at Gen Con? Well, I mean... I am! But hopefully some of you will be there too. If so, come say hello! I will be hanging out at the giant Blind Ferret booth (#541), where you will also find the minds behind Weregeek, Wondermark, and Looking for Group. 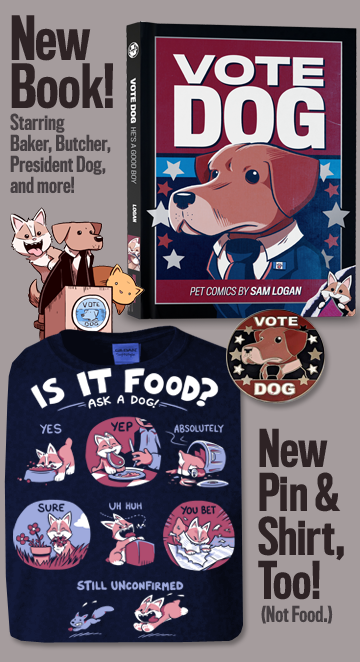 They will also have a wide variety of interesting swag there, both Sam and Fuzzy related and otherwise. It should be a heck of a show! It's time for Gen Con! Today, I'm busy packing up and getting ready for the show. But even so, I have prepped comics and Q and As for you to enjoy. SO ENJOY. It's mandatory. I would love to do a show in Australia someday! But unfortunately, from where I live, the cost of travel and merch shipping alone would be several thousand dollars. There isn't really a way I can make it work unless a convention would like to bring me over as a guest. But of course, if they were, I would be all over that! This is a tricky question to answer! It depends on what you mean. If we're talking about factual/continuity errors, the biggest one is when Mr. Sin refers to Fuzzy as "Fuzzy" at the end of Noosehead, even though the previous time they met, Fuzzy would have still been known as Eric. I had to fix that by later suggesting that "Fuzzy" was one of Eric's frequently used pseudonyms, and not just something Hazel made up later after the mindwipe. It's a little clunky, but it works. And everything else Sin says in that meeting fits perfectly with the Eric backstory -- as it was intended to! -- which still makes for some pretty fun foreshadowing overall. There have also been a few instances where I drew Mr. X's arm on the wrong side by accident -- or, when Jess was impersonating him, on the right side by accident -- and a couple of times where I've had to go back and fix "__ years ago" type captions that were erroneous due to miscounting on my part. On the other hand, if you're talking mistakes as in regrets -- about narrative directions, content, that sort of thing -- that is much harder to answer. 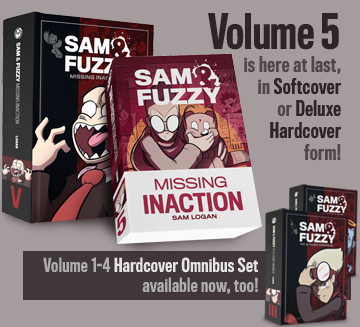 I mean, despite obsessively pre-planning, Sam and Fuzzy is still ultimately a comic I have drawn one update at a time for over a decade. So of course, as the years pass, I look back on old stories and see things I'd tweak or tighten up or do differently, and I talk about some of those things in the commentary section of the Omnibus. But there isn't really any one thing that I, like, especially despise or regret. We return on Wednesday with our next comic! See you then, team.